Leading teams, approving time-off requests, hiring, coaching direct reports—every day, your managers are pulled in many different directions. These same managers are key to the success or failure of your company’s programs, be it harassment prevention, fair lending, or safety programs. New or experienced, every leader at your organization needs a firm grasp on key skills before taking on the task of workforce management. Give your managers the knowledge they need to help your business succeed. With Compligo, you can automate the process of assigning and administering training, so each manager understands what’s expected of them during every aspect of the employee lifecycle: from hiring and onboarding to ongoing employee supervision to discipline and termination. Compligo offers a library of online training covering topics such as harassment prevention, leadership skills, lawful hiring and termination, and much more. 18% of current managers have the high talent required of their role, while 82% do not. Why focus on having well-trained managers? Better leadership increases employee retention. Well-trained managers cultivate better employees, improving customer satisfaction. When managers have greater tools to handle conflict, employees lodge fewer internal complaints. 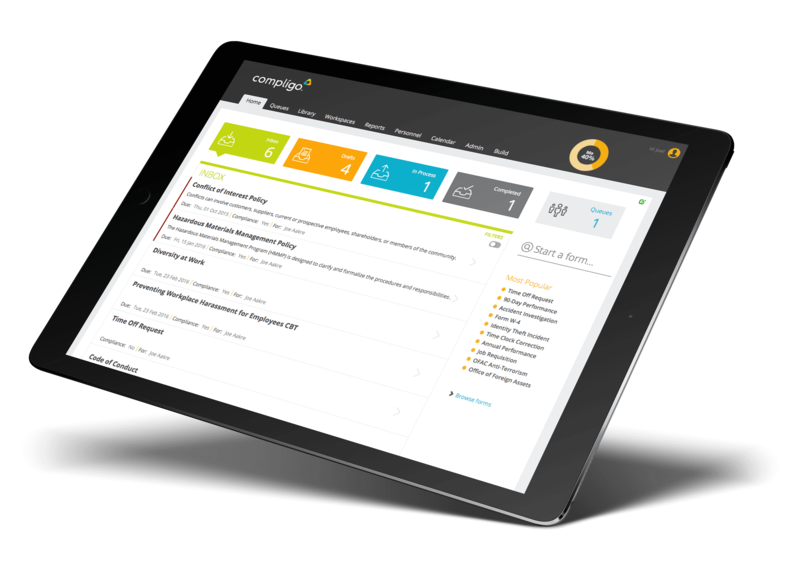 With Compligo’s library of manager development courses, your managers have full access to information about essential focus areas of their jobs, including Baseline Compliance and Skills, Hiring, Discipline and Termination, and Productivity and Teamwork. Compligo takes the guesswork out of new manager training. Rather than leaving you to manually train and track progress of every member of your team, the system automatically assigns training t o managers upon promotion, so new managers get the guidance they need without delay. And schedule recurring training for courses—such as Harassment Prevention—that managers may need to take on an annual or semiannual basis. In Compligo, every manager has access to a comprehensive library of the HR forms, reports, guidelines, and tools they need to accomplish these tasks. There’s no need to hunt around the company intranet or dig paper forms out of the file cabinet. In Compligo, managers can simply search for the appropriate resource from the home page and initiate the task immediately. In Compligo, managers can view the progress of each of their direct reports and track compliance of their team against individual programs. They can also export data for use in other reporting tools, or as evidence in a wrongful termination case or other legal claim. By monitoring the progress of their staff, managers can help enforce and instill the values of their company, and ensure all employees stay on top of their program requirements. A comprehensive personnel file means that you have supporting evidence in the event of a legal challenge against a termination decision. It also demonstrates to your employees that they’re being treated like everyone else. Each employee has a personnel file in Compligo. This file shows all of the tasks and activities the employee has completed, is currently working on, or has yet to start. Managers can drill down into the individual files of each of their direct reports. This functionality provides managers with a granular view of their employees’ progress and a list of overdue activities. Your HR professional can also quickly research articles, guides, laws and forms in HR Support Center’s online resource library. If there are certain state laws that impact your business or industry, the HR Support Center pros can help you understand those rules and regulations as well.